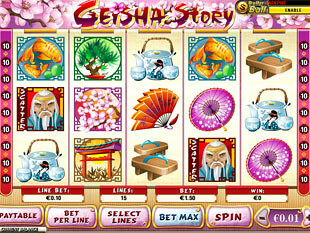 Geisha Story slot machine is a 5 reel 15 payline bonus video slots released by Playtech. With eye-catching design executed in pink colors and Asia-themed images, the game exposes Japanese Geisha culture. On the reels you will find many Oriental icons including colorful Fan, Sakura, Beautiful Geisha and Samurai. The slots will award you a Progressive Jackpot, up to 20 Free Spins with 10 Multiplier and $100,000 top jackpot. Smooth playability combined with colorful design and dynamic sound effects engage into exciting and rewarding gaming. Geisha Story Slots includes wild Samurai symbol. This icon substitutes for all symbols in a winning combo except the scattered Master or Geisha bonus symbol. If you drop 5 Samurai in a winning combo, you are really lucky, because you hit $100,000 jackpot! Elegant Geisha in a purple Japanese kimono is a bonus icon and appears on the 1st and 5th reels only. If you trigger 2 bonus icons simultaneously, you will start your bonus game. What kind of an Asian story can go without a wise kind looking master? In this Geisha Story, Master is a scatter symbol that brings you high awards and multipliers. The scatter pays irrespective of paylines from any position on the reels. Scatter 5 Master symbols and get a prize worth of 50x triggering bets. Thus, if you play with the maximum total bet, your scatter payout will constitute $7,500. Play Geisha Story with any coin denomination between $0.01 and $1.00. You can also increase your line bet up to 10 coins per line. Thus, the maximum total bet can make $150 and the minimum total bet is $0.15. If you play with the maximum coin value and line bet you can hit the first top jackpot worth of 100,000 coins or $100,000 for 5 wild Samurai symbols. The moment Geisha appears on the first and fifth reels, you enter a bonus game. 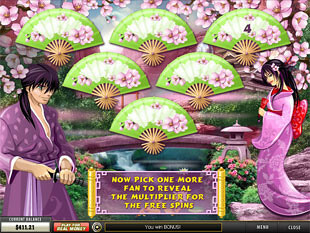 On the screen you will see six Geisha Fans and you have to pick one of them to reveal the number of free spins awarded. You can get anything from 4 to 20 Free Spins. Now you must pick once again and choose your prize multiplier. The multiplier starts at 2x and reaches up to 10x. After defining the number of your free games and multipliers, you start your free spins feature. You can win an extra number of free spins during the feature. 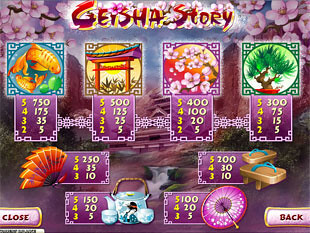 Geisha Story slots contains a lotto-type side game with a progressive jackpot. You will be offered to choose 5 numbers out of 49. On the beginning of your game session, the machine will draw 5 random numbers. The more digits match your selection, the higher payout you get. If the machine draws all 5 numbers that match your selection, you get a Progressive jackpot. 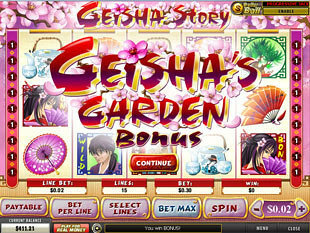 Try Geisha Story slot machine with its 20 Free Spins and 10x prize Multipliers. Win $100,000 or a progressive jackpot. High scatter payouts will reward you with considerable sums and a great theme will grant you visual satisfaction and heat up your interest.